I love the coat! I had one like it all through college and after. It finally disintegrated and I have been bereft ever since! Because he looks very, very silly! That is straight up goofy. Erm…what exactly is he pulling off? He looks like he’s very self consciously trying to look “zany”. Is that what you meant? Because he’s not pulling off any kind of interesting or pleasing aesthetic as far as I can tell. It looks a tad self conscious, but the fellow is happy! What a lovely treat to see. I absolutely don’t like this look but the dude is having such a grin on his face that I’m ok with all the mis-match that’s going on. I don’t get it. This is a walk of shame. I couldn’t agree more. My eyes are bleeding a little right now. C’mon now – are you just messing with us? There is nothing elegant nor chic about this. It’s like cat lady meets circus clown. The jacket in itself is fun..
Not against man wearing skirt but in this case too much pattern going on! There is a way to mix prints, and this is not it. Admittedly, I like seeing a fella in a skirt. Looks like Little Edie went dumpster diving in the Hamptons again. Just a little too much going on here! Absolutely, I do want to want to know what bet was so bad that he had to wear that outfit. Seriously. Still there is a difference between garish and ghastly. And yeah I do like the socks. This is meant to be a joke, right? This is not fashion, this is costume. Shall I laugh or shall I cry? As men’s styling goes, this is the most horrendous thing I have ever seen. Is this meant to be a joke? The floral skirt does not make any sense at all, and neither do those socks. Great shoes but I´m more curios as to the type of bet he lost to have to wear this! Must have lost a bet with friends. ohh!!! why did you do that man??? Even with grandma spare cloths, anyone can make a look!! Astonishingly natural, and beyond, this might be the dressing of a cartoon character. Very Charming . tThis is the most dreadful thing I’ve seen in 21 years of life. You must have led a very sheltered life. I love this! Fab outfit and he wears it well. Great mix of prints! Love the leopard coat! what was he thinking when he left home, that day? Gorgeous and so masculine. I could go for this! Masculine????? Are you seeing the same picture I am? Is that sarcasm? I hope thats sarcasm. DON’T MISS: WANT TO TRAVEL TO YOUR DREAM DESTINATION LIKE ME?? I love the head, the face, the haircut and the smile. Love this guy, and his outfit. Come on, folks, have a bit of fun! The man may well be an idiot but I fail to see how you can deduce this by his choice in clothing. Certo, le case le arreda con più buon gusto! Is he trying to make …fun of the ladies fashion/wear/clothes? If this the opposite of masculine wear for women, we need to get into a serious discussion. I don’t like, the mix doesn’t match ! I’d definitely not wear all this items together at the same time, but the coat is gorgeous! To be on the mean side, I would liken his styling to how I have seen some homeless people dressed around my town….but, I have to say I love the smile and confidence, I dare say he even looks handsome! Kind of ridiculous, I think that is the point. Nice shoes tho…. Oh, please! What some people will do to get attention. The skirt is tasteless – just plain gaudy. There is absolutely nothing right about this picture. WTF was he thinking?? style should be effortless while at the same time every individual should be able to express their own self. here i feel that he tried way to hard. It looks effortless (careless, even) and exactly what he felt like wearing today. How is that not an expression of his own self? Might I suggest that the problem is with your level of tolerance for that of which you do not approve? Nice sentiment Jonathan: but he still looks like a fool. Honestly! I don’t get it. But then, I’m from Arkansas. That said, I do like his face and smile. I believe that it is not a skirt…from the fold in front they are really wide wide leg not so short shorts. I would almost guess he is a clown by profession…not in a derogatory way…but the shoes and the striped top have a sense of that. I cannot express how happy this man’s outfit makes me. Just because some people couldn’t pull this off – or wouldn’t want to – doesn’t mean that this gentleman isn’t feeling fabulous. I love it. I think style is getting confused with “shock factor” with the Satorialist. I must say, he got the guts! His name is Emiliano Salci. 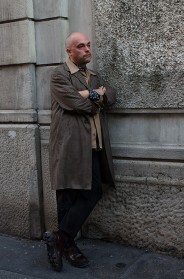 Part of a design duo in Milan called Dimore Studio. The new IT designers. Some very interesting and theatrical aesthetics. ES loves to pose and typically only wears women’s Prada. I visited the studio at Salone del Mobile and asked to take his picture for Instagram. He was thrilled but once I posted my image he reposted it immediately without giving me credit. Frequently appropriates images without giving due credit. Not generous. 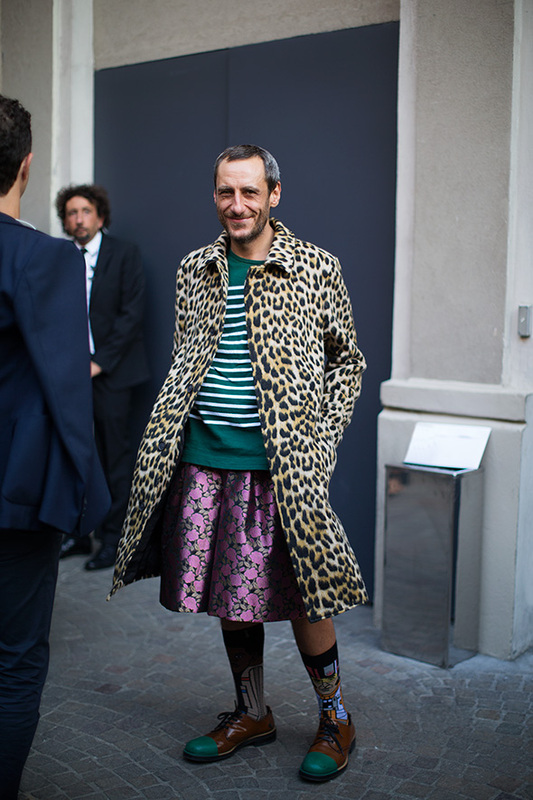 This guy knew exactly what he was doing: dress up wacky enough, and he’ll appear on The Sartorialist. I love every item individually, but not like this. A very badly tossed fashion salad. Perhaps his doctors could titrate his meds just a little closer to therapeutic…..just a thought…..gotta love the smile and the twinkle in his eyes. I soooo love this guy…he so doesn’t care about what you think people!! Oooooh, yes, he does care! He’s purposefully looking for attention. He is creating a “presence”. And here he is, and we are all looking at and talking about him. Good for him – unable to comment stylewise but this is a great shot. Well he is definitely dressed to get peoples attention, unfortunately not for the better ! Oh Jesus Christ. Come back Grayson Perry all is forgiven. while i appreciate his sense of creativity…he’s trying way too hard though he did go all in!! Dimore studio, forever my favourite!!!! He is not only wearing a breezy skirt, but wearing an explosion of color. Only a funky hat is missing. I am a man and am even wearing a man-skirt at the moment, but I go for a very subdued look that blends in as much as possible. I am not as brave as this guy. it takes real guts to dress up the way this guy has.. The coat, the shoes, the socks. All good. Just not all at once, please. I love this picture. I love how crazy it looks. Style is when you just rock it no matter what people think. Its a little shocking, somewhat fun and most definitely stylish in a weird way! Im feelin’ this picture!